Charters of foundation, land grants, and privileges had to be recorded and kept by medieval monasteries. These important documents would have been bound together in a book called a cartulary. 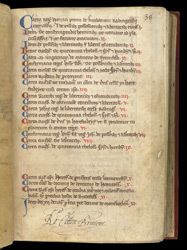 This cartulary contains the documents pertaining to the abbey of Reading. It was founded by a charter of King Henry I in 1121, and a few years later, in 1123, the king granted it the manor of Leominster, which became a cell or subsidiary monastery of Reading. Reading and Leominster were part of a powerful and influential network of monasteries, centred at Cluny, the great monastery in France which answered only to the pope. This page lists the documents contained in the manuscripts. It begins with Henry I's foundation of Reading. Further down the page the granting of the manor of Leominster is listed. The 17th-century owner of the manuscript, Robert Cotton, signed the page in the lower margin.